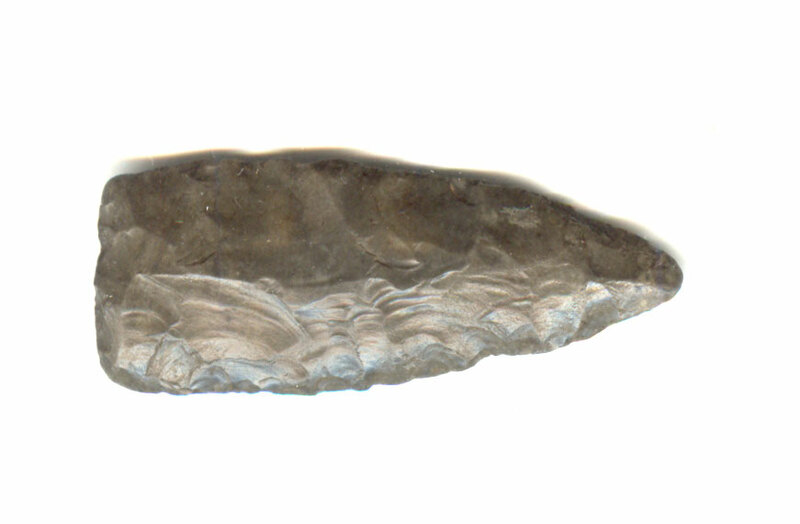 A Small To Medium Size, Thin, Visibly Aged And Anciently Use Sharpened, Nicely Flaked, Well Made Goshen Point That Exhibits Surface Aging Coloration And Overall Stone Patination, Heavy Rolled River Polish, Correct Blade Sharpening Use Reduction, Correct Type Early Flaking, Aged Surface Deposits, Correct Material And Manufacture For The Area Found. Found Below The Eufaula Dam In The Canadian River On A Gravel Bar. The Thinness, Rounded Basal Corners, Horizontal Type Blade Flaking, Thinned Style Base Determines The Type. This Rare Example Displays Heavy Aged Rolled River Polish. Includes A Ken Partain Certificate Of Authenticity.